This year was the second year I was in charge of setting up the haunted house for Vintage Parkway Elementary School Harvest Carnival, which takes place on the Friday prior to Halloween night. This year’s design actually began last year, while building the 2013 incarnation of what I called the 6th Floor Haunt. Last year was challenging, but Mark Greer and I feel we worked out some of the layout and design flaws from last year and put together an effective haunt for the school. A day after the haunt was over, I started creating the layout for 2014. I had some ideas that I felt would work better when implemented. Like last year we were limited to the stage area, an area of 24’x36′ with 3 exits and the hard sided curtain in the closed position. We learned a bit from our mistakes in 2013 and hoped to avoid those problems that slowed us down last year. Unfortunately the design wasn’t implemented as drawn up. Earlier in the year after I had a solid design, I laid out all the PVC out in sections on the grass in order to assure we had enough PVC to construct the layout. Thankfully we did not have to buy a single piece this year. Section 1 (entrance/hall of faces) and the section 3 (dot room/oodles of noodles/clowning around) were built using PVC, while section 2 was all new, built out of wood. As it goes, we remained flexible and made changes on the fly while putting the structure together. 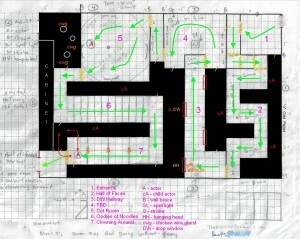 The layout and design was contingent on the props and rooms I had planned. I decided to bring back two areas we used last year, while making an improvement to a third. We introduced three new areas to the 6th Floor Haunt, replacing the inkblot room, graveyard and labyrinth from last year. In an attempt to use the electrical outlets, I planned more dead space or actor corridors than last year. This would hopefully make moving the scarers (5th graders) in and out of their assigned areas. It would also allow those behind the scene actors to move freely. Only needing to hang plastic on one side a wall would decrease the amount of visqueen required to fill out the rooms and hallways. We continue to miss one crucial aspect to a Halloween haunt, a unifying theme to improve the overall experience. It wasn’t until the beginning of October when it was decided we were going to use clowns as our theme. Many people are terrified of clowns, so we figured we toss in some crazy clowns in an attempt to tie the haunt together.